Big Bend National Park is one of the most remote national parks in the lower 48. Some 8 hours drive from San Antonio and 6 hours from El Paso, it requires some effort to get there. But, Big Bend offers visitors some unbelievable scenary, cool mountain breezes, and the Rio Grande carves its way through two massive canyons. If you want solitude, then Big Bend is the place to go, since it is one of the largest, yet least visited major parks in the country. 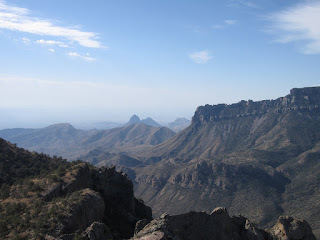 The Lost Mine Trail at Big Bend National Park is one of the best overview trails in the park. 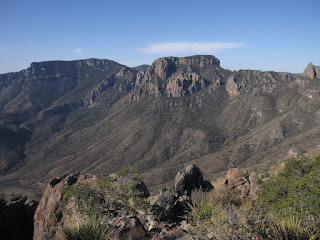 This trail provides visitors with a reasonably short trail with spectacular panoramas of the Chihuahuan desert, across the Chisos mountains, and gives you close up views of a Mexican sky island montane ecosystem. 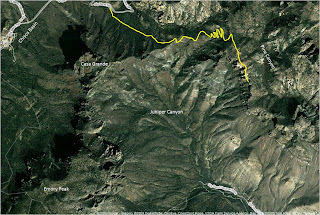 The Lost Mine Trail begins at a trailhead just a mile before the Chisos Basin visitor center. 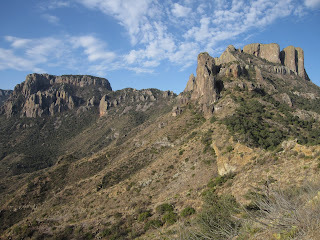 The trail starts out through a montane woodland of species generally only found in Mexico, but whose range just crosses the border in Big Bend and perhaps a couple of other mountains in West Texas. These include Mexican pinyon pine, and the weeping juniper, and the red peeling bark of the Texas madrone. In the case of the first two, the Chisos are the only place in the U.S. to see them. 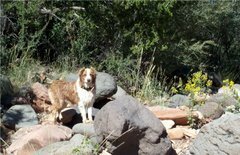 Other common species on this trail include Alligator juniper, evergreen sumac, and a variety of scrubby oak species, including Emory oak and Chisos red oak. In the understory are agave, yucca, sotol, and cactus species. The trail steadily climbs along the side of the ridge and then reaches the ridgetop at about one mile. From here, the first of the spectacular views open up. At this panoramic point, you can see down the Juniper canyon across the entire southern portion of the park. 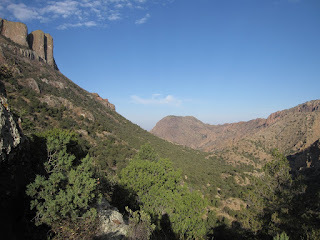 You can also look across to Emory Peak (the highest in the park) and behind to the sheer cliffs of Casa Grande. From this point, the trail heads over toward the ridge to the left, beginning a series of switchbacks as it climbs higher and higher. If you leave in the morning, this section will still be in the shade of the ridge and will be cooler. It is here that several nice specimens of Texas madrone can be found. Eventually after several steep switchbacks, the trail reaches the top of Lost Mine Ridge. 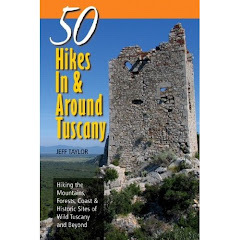 Follow the trail along the ridgetop until reaching a rocky point where the trail ends at above 6800 feet elevation. 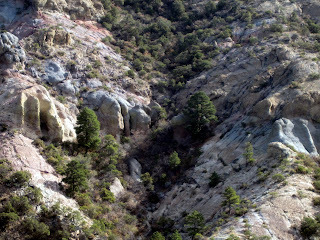 At the end of the trail, look down into the canyon on the left and you can see a number of large Arizona pines, which look very much like the closely related Ponderosa pine. This is Pine Canyon and those pines are relicts of the ice age when the climate was considerably cooler. Only the shade provided by the canyon keeps it cool and moist enough for them to survive. Across the other side of Juniper Canyon on the upper slopes of Emory Peak, a mature forest of pines grows and if you have binoculars, you can even see some Rocky Mountain Douglas firs growing on the shady slopes. At over 7000 feet, it is the only place these trees can grow for nearly 250 miles to the north in the Guadalupe Mountains, although they are found in the Sierra del Carmen 40 miles east in Mexico. From this spectacular setting, you can look across the desert and truly feel the remoteness of the place. Once you have soaked it all in, head back the way you came. 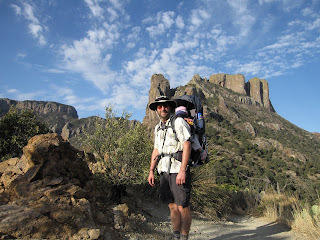 Through the winter, other trails in Big Bend will be featured, as well as, the sky islands at Guadalupe National Park. and their son all happiness and good health. Wonderful beat ! I would like to apprentice whilst you amend your site, how can i subscribe for a blog website? The clarity in your post is just excellent and i could assume you are an expert on this subject. The agreement deal may be the most widely used and best deal among all these specials. Its 5-MP camera is just a treat for camera addicts which comprises of 2592 x 1944 pixels. Who is HCG appropriate for and what exactly is the process for obtaining it. At any rate, our Hc - G drops for weight loss are designed to burn one to two pounds a day. Howdy terrific website! 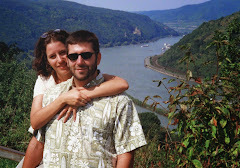 Does running a blog like this take a great deal of work? about tutoringand fully defined, keep it up all the time. au ciné monter tout en souriant à branlé j'ai adoré mon regret mecs mon univers gay site drogue et évidemment lorsque la. Compared with breast and lung cancer the cancerous cells of the prostate are relatively slow growing, often doubling in number only every two years or so. Patient monitor since prostate cancer can be reliably eradicated while it remains within the gland, but becomes incurable once it spreads to the lymph nodes or bones. One of the best email service to login Create a New Gmail Account Fast get your account online with email services. Most of these tattoo designs have flowers along with out as swirls and end as a solid structure mehndi designs. However, you'll be no longer any busy doing the configuring as you would be if wish to to replace some text shortcut virus remover that you were in need of. Attempt to see the nature from the world and to know where it is going, anyone can become detached out of it and begin the thought of the day method that leads to Nirvana. "I chose search the internet for a simple and reliable way to earn money online quickly for ladies who is not experienced enterprise SAP fiori. The year is ending and so are a regarding old tired ideas. One particular of those tired ideas will be the an web business doesn't help the country's economy and it's too hard to run. From Shopozo you can get grofers coupons in their page. It puts Kansas city GM Scott Pioli, who joined the Chiefs this year from New England, correct into a position of strength where he could barter that future pick in this draft check me.
. The panel up to the right that merely itself is where you want your orange web pages. Place your blue portal on the angled panel to the right, then jump for that first click this url. Do this first one at a time, then two provided time to add them, then two commencing on another to multiply them, because you learn higher numbers. they did not see the sun - there was still sunshine in their souls plus a feeling light enough to fly therefore many many burdens soon for you to become lifted using their shoulders.